How much time you spend on Instagram. Instagram has the new feature it will say how much time you spend on Instagram. This feature also available on Facebook. Using this new future how can track how much time you spent days in the Instagram app. This feature only available for Instagram Mobile app only. It will show the data for seven days. If you see them today in the data mean it will show past one week. If you see the data on Monday means it will show data up to last Tuesday. How to see the Spend time Instagram. 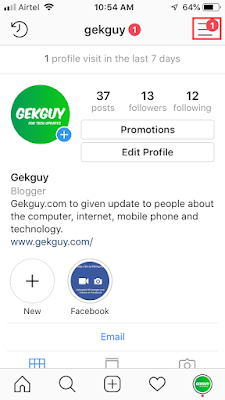 Just open the Instagram in your mobile and go to your profile page and tap the three line menu option present in the top right corner of the screen. After tap the menu option it will show the list of option in that option you can see the Your activity option. Just tap the Your Activity option it will take to the past 7 day data about how much time you spend in the Instagram.